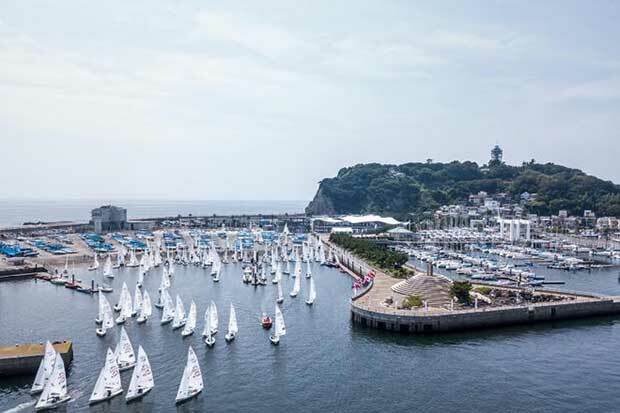 The 2017 470 Junior Worlds has descended on the iconic sailing venue of Enoshima Yacht Harbour, host to the 1964 Olympic Sailing Competition and to the upcoming 2020 Olympic Games. Enoshima Yacht Harbour is also the only venue to host two Olympic events over different Olympics. You can feel the history made here over 50 years ago pulsing around the venue, with photos of the 1964 Olympic legends displayed and a powerful aura of Olympic success. For many of the teams at the 470 Junior Worlds, Tokyo 2020 is an achievable goal, and there can be no underestimating the inspiration this venue fosters. The International 470 Class last held a World Championship in Japan twenty-eight years ago, in 1989, at Tsu City located to the west of Enoshima. Many of that year’s Championship leaderboard went on to Olympic glory at the 1992 and 1996 Olympic Games, and inevitably future Olympic medals will beckon for some of the 126 junior athletes competing this week. Both defending Champions in the men’s and women’s events are returning, and warmed up well to defend their titles. 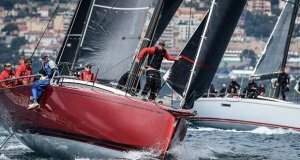 For last year’s winners, Japan’s Keiju Okada, who is now partnered with Kotarou Matuo and Spain’s Silvia Mas/Paula Barcelo, victory at last week’s All Japan 470 National Championships has put their rivals on notice that business is set to continue as last year. But their is plenty of talent in the line-up ready to unseat them, including the recently crowned 470 Junior European Championship medallists. The weather forecast for the racing ahead in Sagami Bay is set to start light, around eight knots for Monday’s opening day, before switching to breeze and the likelihood of big waves for which Enoshima is renowned on Tuesday. The bay is likely to deliver a range of racing conditions, and depending on the prevailing weather three race areas can be used, guaranteeing a perfect race track challenge. The Opening Ceremony on Sunday 27 August kicked off the Championship, with a performance of traditional Japanese drumming, and with the opportunity for teams to have a go. 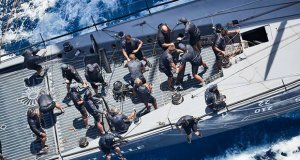 Amongst the teams competing from fifteen nations, Japan fields the largest with thirty-four boats, 25 in the men and 9 in the women. 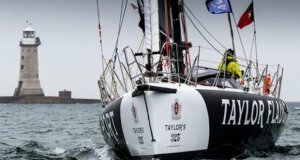 Racing gets underway on Monday 29 August, with two races scheduled for each of the 470 Men and Women starting at 1100 hours. Warming-up at the All Japan 470 National Championships last week, gave an indicator of potential form at the Junior Worlds and enabled the defending 2016 470 Junior World Champion, Keiju Okada, the opportunity to fire a shot across the teams looking to unseat him on home waters. Okada was joined on the National Championship podium by team-mates, Tetsuya Isozaki/Akira Takayanagi and Naoki Ichino/Takashi Hasegawa who also feature in the 470 Junior Worlds line-up. Okada won the 2016 470 Junior Worlds with former crew Naoya Kimura, but as his crew at the Japan Nationals is too old to race the Junior Worlds, he has partnered with Kotarou Matuo for the week ahead. Okada, who is Captain of the Waseda University Sailing Club, emerged from Japan’s prolific Universities 470 sailing programmes, after a successful lead-in career including third at the 2010 Optimist Worlds and fifth in the 420 at the 2012 Youth Sailing Worlds. Clearly, Okada/Matuo are ready and waiting to face off against the many teams who are set to claim gold on the defending Champions’ home waters. A very real threat will come from the twenty-four other Japanese teams, including last year’s Junior World bronze medallist Daichi Takayama racing with Naoya Kimura. Takayama was also the 2015 420 World Champion. 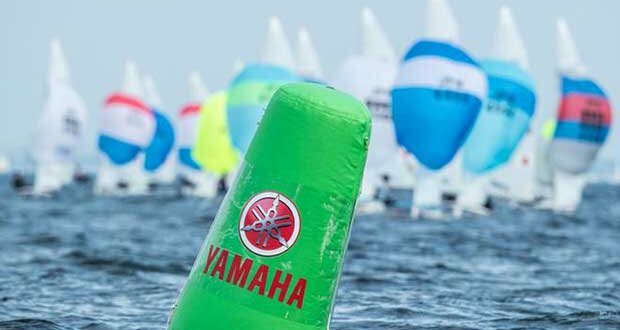 Right up in the battle will be all the podium teams from the 2017 470 Junior European Championships on Lake Garda earlier this month, as well as four other top ten finishing teams who made the dash from Italy to Japan. There, it was Italy’s Giacamo Ferrari/Giulio Calabro who managed to thwart the challenge and defend their title over France’s Hippolyte Machetti/Sidoine Dantes. Israel’s Maor Abu/ Yoav Rooz (ISR) came in third, marking a career best result for the Israeli pair, with Hungary’s Balázs Gyapjas/Zsombor Gyapjas close behind. All these teams meet again, up against a plethora of international and Japanese talent, to settle a new score on new waters. It is inevitable that the win laid down come the end of the 470 Junior World Championship may well be the same challenge which will repeat at the 2019 470 World Championships in Enoshima, and again the following year at the Tokyo 2020 Olympic Games. Spain’s Silvia Mas/Paula Barcelo arrived in Japan on one simple mission, to defend their Junior World title won in Germany last year. An assured performance at the Japan Nationals has boosted their confidence ahead of racing. The newly crowned 470 Junior European silver medallists, Marina Lefort/Lara Granier (FRA), matched that result with a second at the Japan Nationals, as they maintain their run of form, with third going to Japan’s Mano Udagawa/Yurie Seki (JPN). 2015 470 Junior World Champions, Benedetta di Salle/Alessandra Dubbini (ITA), will also be hoping to add another victory to their incredible pedigree, and upgrade their fourth place from the 470 Junior Europeans. The entry list counts teams from Australia, France, Israel, Italy, Japan, Poland, New Zealand, Spain, Sweden, Turkey, USA.